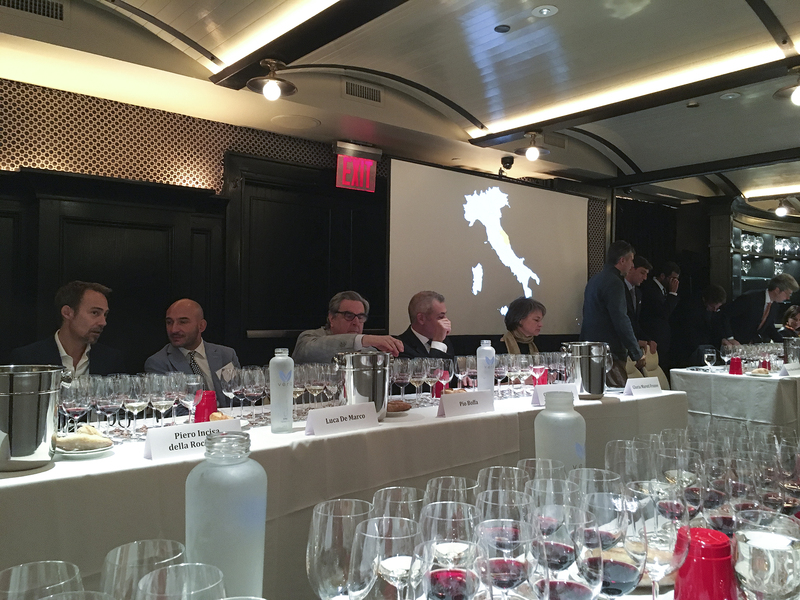 Special invitation to a guided tasting with many top Italian wine producers hosted by Del Posto restaurant. The food and service at this restaurant are impeccable. A perfect venue for an extraordinary event. 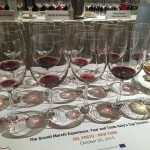 The Institute of Fine Italian Wines – The Grandi Marchi is a who’s who of the Italian winemaking world. Alois Lageder, Ambrogio e Giovanni Folonari Tenute, Antinori, Argiolas, Biondi Santi, Ca’ del Bosco, Carpenè Malvolti, Donnafugata, Gaja, Jermann, Lungarotti, Masi, Mastroberardino, Michele Chiarlo, Pio Cesare, Rivera, Tasca d’Almerita, Tenuta San Guido, Umani Ronchi. “these are not just good wines…this is a synergy of friendship…of these family brands and their terriors. (They are) defenders of their terroir. 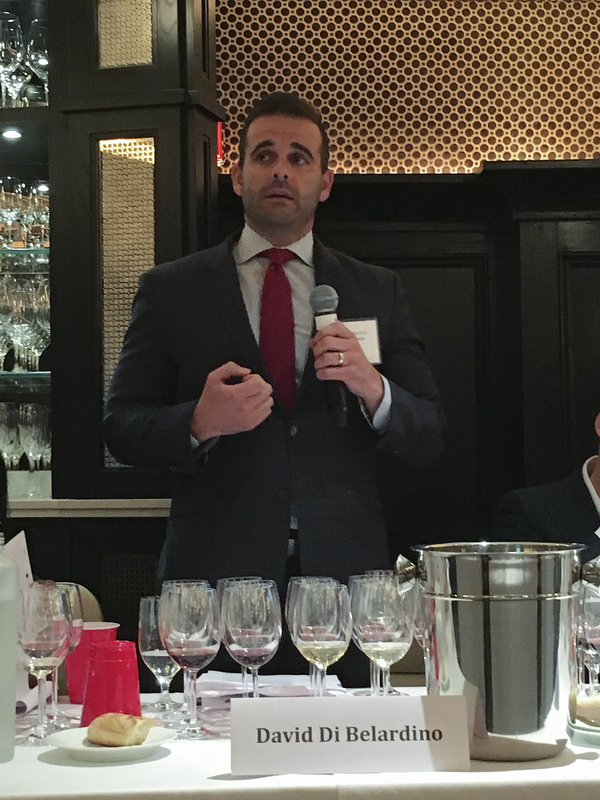 Although I was tempted to post tasting notes for each wine, I found the colorful commentary of the wine presenters much more interesting so I will share that with you. Ca del Bosco – Cuvée Annamaria Clementi, Franciacorta Riserva D.O.C.G. Maurizio Zanella explained the difference between La Franciacorta (the girl) which describes the region and Il Franciacorta (the boy) which describes the wine. 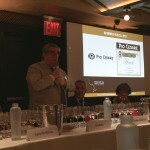 Seema Parthasarathy shared the story of the naming of the wine which I had read before. The name Ca’ Marcanda is a contraction of the word ca’ (casa), meaning “house,” and marcanda, meaning “long negotiations.”. It took them over 10 years of meetings to obtain the property. Vistamare is a pun on the term “ocean view” which many small hotels advertise to lure guests. The vineyard, and it’s wines have noticeable ocean influence. Seema also described their use of neutral oak as “a pat of butter” (on rye toast) to indicate the subtle but helpful influence of barrel aging for this wine. Interesting fact: In Le Marche (the region where their wine is grown) residents consume the most wine in Europe, and, they have the longest life expectancy. Piero Incisa della Rochetta described Bolgheri (the area that his ancestors chose to plant wine) as “forgotten by man and God…only known by pirates”. 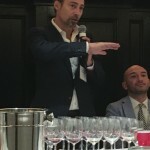 He also shared that he often says that Tenuta San Guido makes “the most Pinot of Cabernets” because they aim to make them less concentrated with well integrated, finer tannins. This produces a lighter, delicate, expression of a grape that can sometimes be overpowering and unapproachable when young. 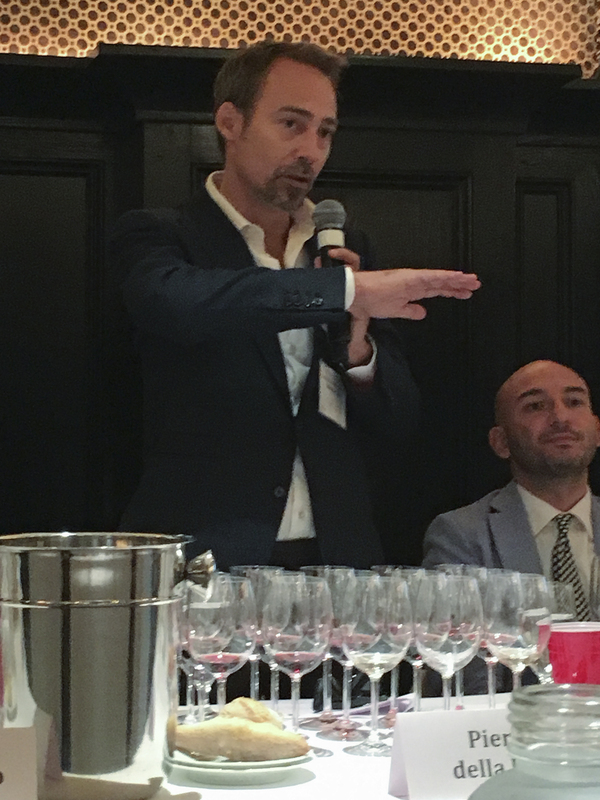 Luca De Marco explained that it is the heavy minerals (magnesium and others) that allow Barolo in their terroir to produce so many unique and interesting flavors like balsamic, mint and rose leaves. 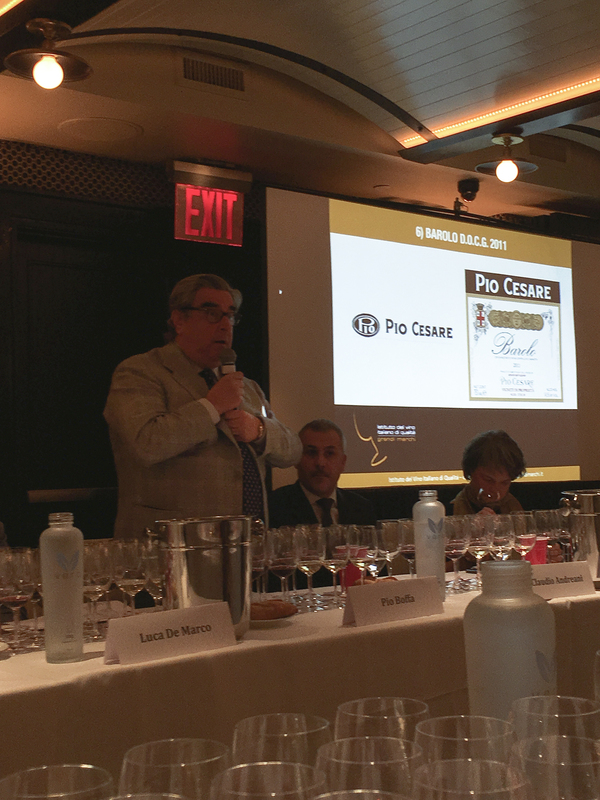 Pio Boffa shared their philosophy “..we do not depend on the skill of the winemaker but rather of Mother Nature,” to explain their non interventionalist style of winemaking. 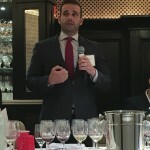 Antinori – Pian Delle Vigne, Brunello di Montalcino D.O.C.G 2010 presented by Niccolo Maltinti. The vineyards in Montalcino are closer to the ocean (dotted-line) than the vineyards of Chianti or Montepulcino so they believe they have a coastal influence. 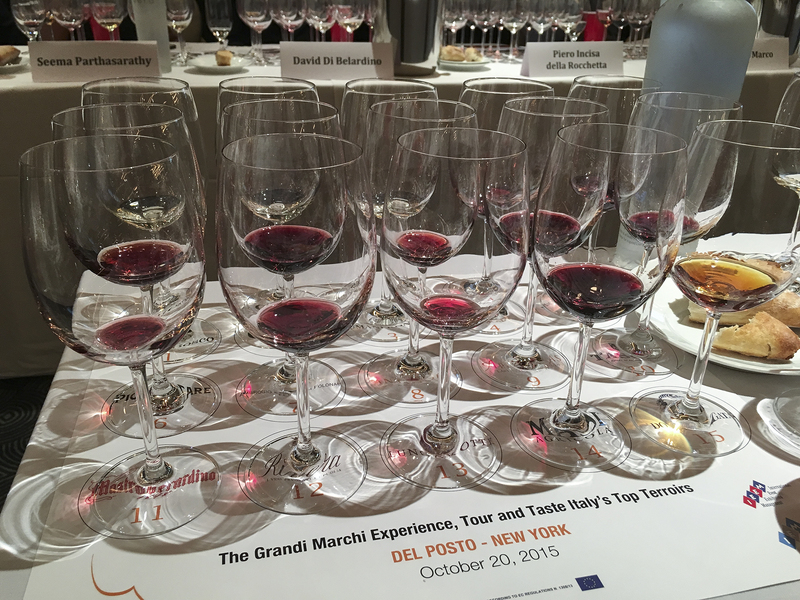 They shared that they don’t feel that Sangiovese grown outside of Italy lives up to their standards even though specific clones from Poggio di Sotto where brought into the U.S., and planted on what they believed was the best location (Atlas Peak). Alberto Tasca related that this wine translates to “red of the Count”, which means “I am making this wine for the Count (me), no one else”. He also called this wine a “Super Tascan” wine which drew laughs from the crown. Historically the blend of this wine was dictated by the planting of 2 rows of Nero di Troia for every 1 row of Montepulciano, this became a blend of 70%/30%. The traditional blend for Amarone is predominately Corvina, with Rondinella and Molinara. This one also uses 10% Oseleta which has small berries and thick skins which adds tannin and structure which is usually the part played by the Rondinella. Donnafugata – Ben Ryé Passito di Pantelleria D.O.C. 2008 Limited Edition presented by Antonio Rallo. The name comes from the Arabic term “Son of the Wind.” A typical bottle of this wine needs 4kg of grapes to produce. This results in concentrated sugar as well as acidity which produces 27 proof (14.5%) alcohol. This entry was posted in Italy, Uncategorized and tagged grandi marchi by toleranttaster. Bookmark the permalink. Thank you Doug for the article, just please note that the owner of Masi is Raffaele Boscaini not Sebastiano de Corato. Sebastiano de Corato is the owner of Rivera. One of the great things about publishing on the internet is that you can instantaneously correct mistakes. Thank you for reading and responding.